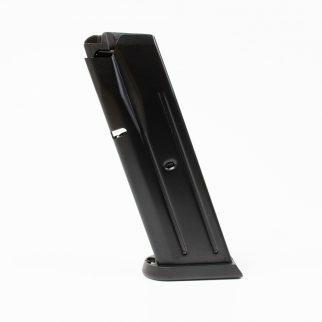 Nickel plated billet aluminum magazine base pad. Fits Factory CZ 97 magazines only. Will not fit any other magazines for the CZ-97’s. Due to manufacturing variations in magazines, in isolated cases, some fitting could be necessary. If the new CGW mag base will not install easily, or will not install with a very light tap on the base plate with a wooden dowel or plastic hammer, some minor adjustment may be needed on the “flange” the base plate slides on. If needed, call CGW for tech support.